Bilderberg meetings are annual conferences attended by powerful people, most of them from Europe and North America, who include royals, future presidents and prime ministers, ministers, heads of companies, central bankers and other influential individuals. 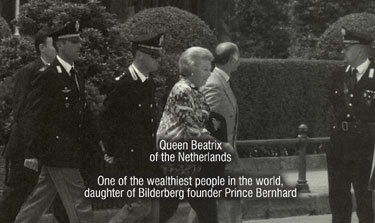 The conferences last a few days and they have been held every year since 1954 except in 1976 when Prince Bernhard of the Netherlands, founder of Bilderberg, had to resign following his conviction for corruption. They always take place in a luxury hotel somewhere in Europe or North America, and they are discreet to the point of secrecy. Only in the last few years has Bilderberg officially acknowledged its own existence through an official website (http://www.bilderbergmeetings.org/index.php) and the issuing of short press releases. Practically no information or comment is to be found about these annual events in mainstream media anywhere in the world. – how come that this group which includes prominent people in elected positions, and therefore accountable to voters, never reports on its meetings ? – why did this group operate until very recently in almost total secrecy ? – who organises the heavy police protection offered to these meetings, and who pays for it ? – what sort of decisions are taken directly or indirectly as a result of these meetings? As no serious answer to these and other relevant questions has ever been provided by Bilderberg itself, researchers in alternative media have offered their own hypotheses. Which revolve around global conspiracy. Not without reason when you look attentively at the list of attendees of meetings and the sort of activities and policies in which these people are influential actors. And the idea of a global and highly manipulative conspiracy is reinforced by the extraordinary silence of virtually all mainstream journalists in all countries on the subject of Bilderberg. But the 2013 conference, which will be held from the 6th to the 9th of June at The Grove Hotel near Watford, England, is likely to be much more widely reported on than the previous events. Activists are organising a “Bilderberg Fringe Festival” (http://www.bilderbergfringefestival.co.uk/) and have sent invitations to mainstream media. At the end of last week a few established papers had already published articles on the coming of Bilderberg to the Watford area. See for instance http://www.independent.co.uk/news/uk/politics/watch-out-watford-here-comes-the-secretive-bilderberg-group-8626134.html, and http://www.dailymail.co.uk/news/article-2333672/Royalty-statesmen-descend-Watford-hotel-secret-Bilderberg-summit-amid-fears-violent-anti-Capitalist-protests.html. If you glance through these two articles, you will notice their rather strange style and ambivalent content. As if it was so delicate for a journalist to touch the subject. In a few days we’ll see the effect of the “Fringe”. Do participate if you are near by, it may be fun, and it will be useful. Showing that many people refuse to be treated as sheeple is salutary for us all. Make sure to remain totally peaceful and non aggressive. The elite are slaves of arrogance and aggressiveness and expect others to behave and think likewise. Give them kindness, humour and harmony. Fear not, look beyond the screen of illusory reality.